February kept me so busy with work that I had to learn a new French phrase: date limite. The French sounds a lot less morbid than deadline — or ligne morte — but I think the English better captures the anxiety I suffered wondering if I could get through everything. At least “deadline” suggests the possible cardiac outcomes of my superabundant work stress. Of course, all this is a long-winded excuse for failing to write a blog post during the past month or more. But before you waste too much sympathy on my sorry state, I should mention that part of my deadline anxieties stemmed from the fact that I had committed to spending a week of February on a family vacation in Napoli and Capri. Considering the bad rep that Naples gets from many tourists, perhaps you do pity our choice of vacation spots. To read online accounts, one would imagine that Naples is the eighth circle of hell, populated entirely by thieves, every sidewalk littered with trash. The internet is filled with woeful tales from unwitting innocents who stumbled out of Napoli’s stazione Garibaldi only to have their purses viciously snatched away within moments by vespa-riding camorristas making their getaways behind mountains of refuse. 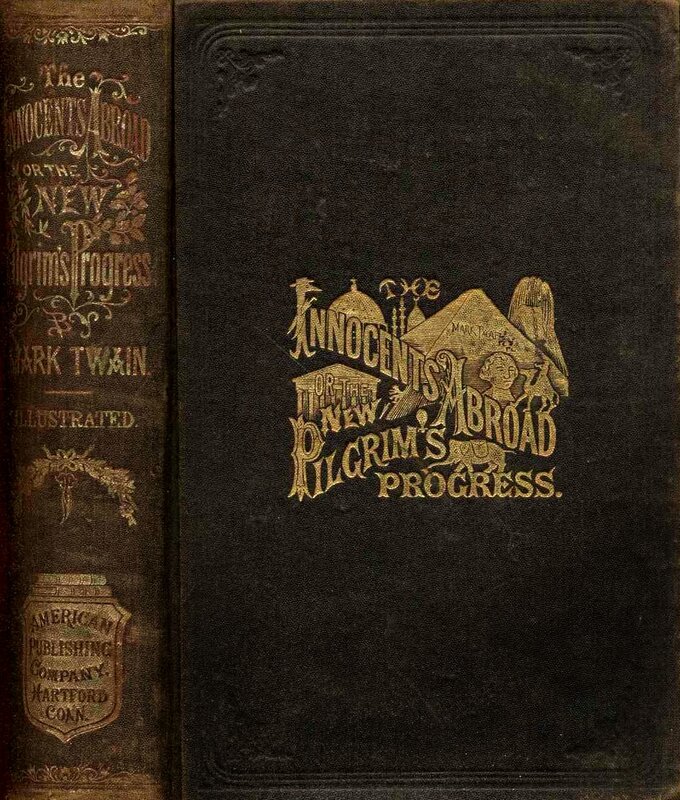 Twain’s main complaint about the Neapolitans concerned their way with money. “These Neapolitans always ask four times as much money as they intend to take, but if you give them what they first demand, they feel ashamed of themselves for aiming so low, and immediately ask more.” He bemoaned that “one can not buy and pay for two cents’ worth of clams without trouble and a quarrel.” But here I think Twain sadly missed the forest for the trees. Two cents for clams! Who cares about the quarrelling, Naples is a gourmand’s delight. After we arrived in Napoli on a Friday morning (following an inexpensive crack-of-dawn flight from Paris), we spent our first day wandering the streets of the old part of the city, where we had booked a hotel room. Soon we regretted that decision. Gazing with greed upon the trays of live vongole, gamberetti, polpi, and calamari, I wished with all my might for a kitchen. 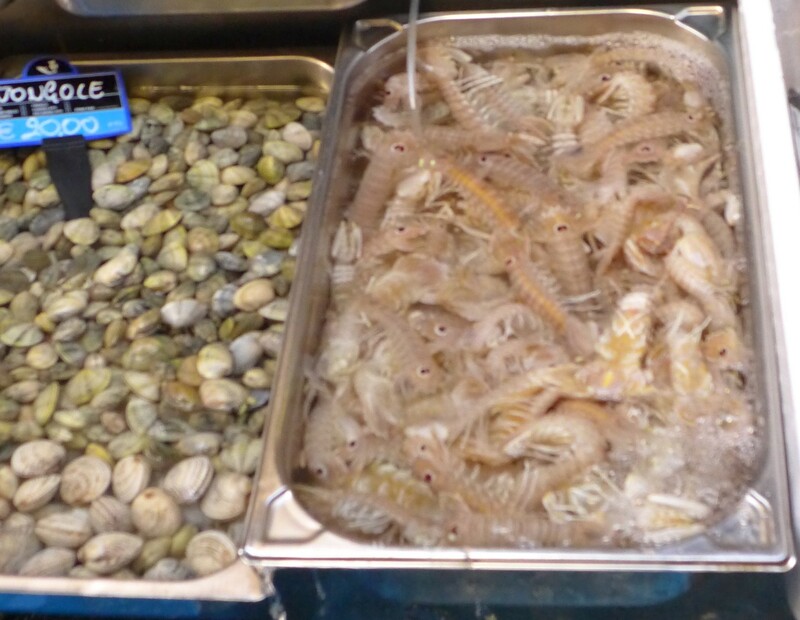 The clams have gone up in price since Twain’s time, but the prices in Naples are still a welcome change from Paris. 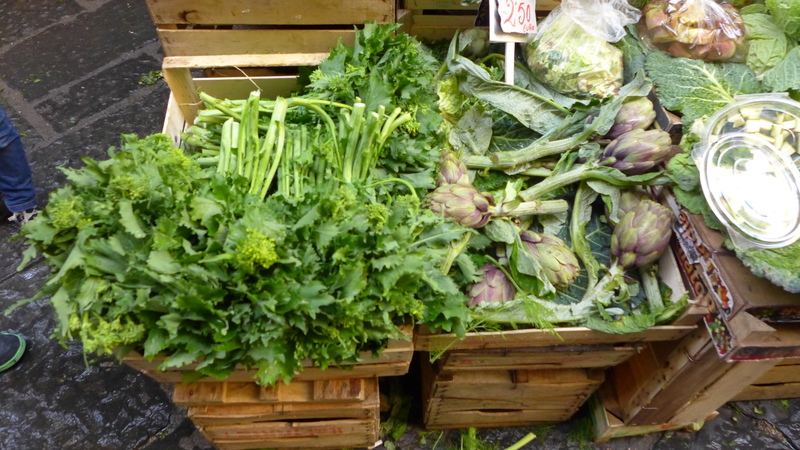 The turgid violet artichokes, €2.50 a bunch, were a steal. I cried bitter tears of longing over the heaps of vivid green rapini. Within an hour of our arrival we were making plans for our return – next time to an apartment with a stove. On the plus side, our lack of kitchen drove us out to the restaurants. If you ever read any good reports of Naples, the praise is bound to be directed towards the city’s most notable contribution to world cuisine: pizza. Our hotel was only a block and a half from the beginning of via dei Tribunali, the epicentre of Napoli’s pizza culture, site of such renowned eateries as Sorbillo, Di Matteo, and Pizzeria Decumani. Is it any surprise that Tribunali was our favourite street in the city? We ate at Sorbillo on our first afternoon. Pizza is the only decor at Sorbillo, each plain table being entirely covered by platters bearing massive pies, glistening with golden olive oil, brightened by verdant leaves of fresh basil, heaped sumptuously with fresh mozzarella. I wanted to move in. 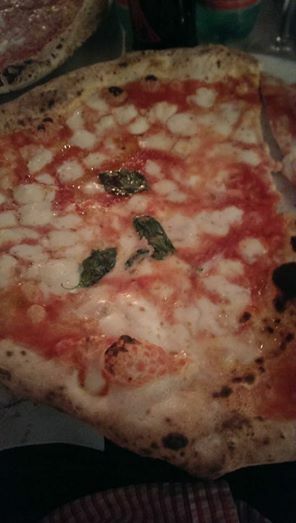 Despite their enormous size, custom dictates one pizza per person – and how can you complain, considering that a simple margherita will set you back only €3.50. Never has €3.50 been better spent. I enjoyed this meal more than almost any I have ever eaten at any price. It was all about the crust: thin, stretchy, chewy, blackened, flavorsome. The mozzarella and tomato sauce (san marzano from the nearby slopes of Mount Vesuvius) were beautiful dressings, but the soul of the pie was its crust. The kids would have been happy to eat every meal for the rest of our stay at Sorbillo, and I probably would have been as well. But I’m glad we ventured further – because we had an even more wonderful meal a couple evenings later on neighbouring via Spaccanapoli, at the pizzeria Lombardi. New Yorkers will know that name from the restaurant on Spring street that calls itself the first pizzeria in America. Lombardi’s in New York used to be a favourite of my brother-in-law’s, and I enjoyed many pies there back in the day (before the artisan-pizza fad expanded NY’s Neapolitan offerings, a development which happened after my time). No disrespect to New York’s Lombardi’s, but its Neapolitan cousin now holds top place in my heart. We went there on a Sunday night, when every sensible Neapolitan eats with family, and consequently we had the restaurant almost entirely to ourselves. Choosing a table right by the oven, this time we ordered a little more adventurously: a margherita for Maya, a prosciutto pizza for Eli, a pizza with escarole, anchovies, and olives for me, and a dish of gnocchi for Tim. 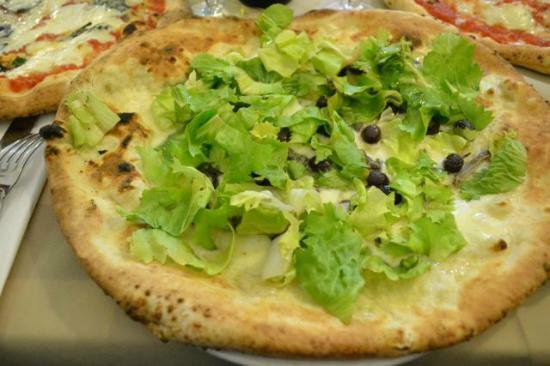 I could sing the praise of my escarole pizza the rest of the night – the bitter fresh greens, the salty tang of the olives, the powerful brine of the anchovies, the chew of the crust: pure heaven. And Tim’s gnocchi were revelatory; I never understood before why people described gnocchi as pillowy. These were ineffably light, and yet substantive, neither mushy nor cottony. I had a hard time keeping my fork out of TIm’s bowl. The gnocchi beat the socks off the pasta dishes at the more upscale Spanish Quarter trattoria where Tim and I had shared a romantic meal à deux the prior evening. But the true highlight of our meal came at its end, when we encountered the wonderful generosity of Neapolitan culture. As Tim and I sat enjoying our last glasses of wine, Maya went to stand by the oven and watch the pizzaioli. There were two at work, a man who prepared the pizzas and a young woman who worked the ovens: two at work, but not a lot of work to do, so soon we began talking. Finally the last and most exciting step: the young woman who worked the ovens let Maya grasp the paddle and slide the pizza into the oven herself (with a little guidance of course). According to the chef, the oven reached temperatures of over 700 degrees celsius! (around 1,300 fahrenheit). The proof was in the pudding – Tim clocked the average cooking time of a Lombardi’s pizza at less than 90 seconds. The pizzas went in, had a quick sear on the bottom, then the pizzaiola shifted the pie around a little to perfect the blackening, before quickly sweeping it back out, still wet in the middle. Perhaps a better mother would have kept her kid away from a 1,300 degree oven, but Maya was so excited to wield the paddle. 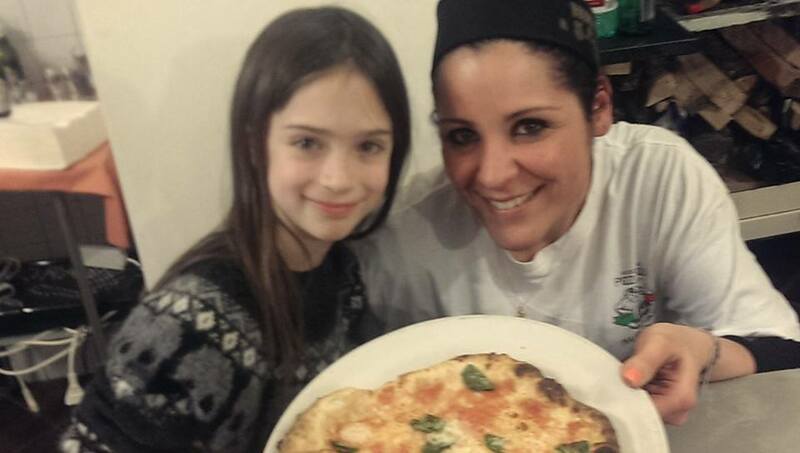 For two straight days following she talked repeatedly about becoming a pizzaiola when she grows up, and bringing Neapolitan pizza to Victoria (watch out Prima Strada). 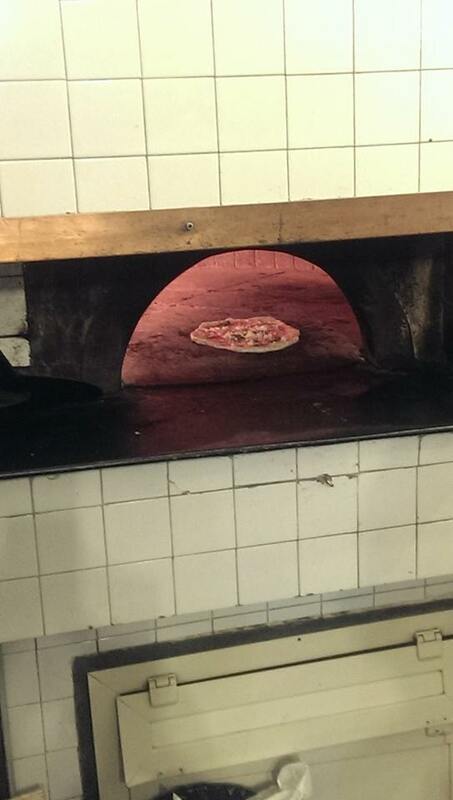 However hot the ovens at Lombardi, the restaurant’s true warmth resided in its staff. 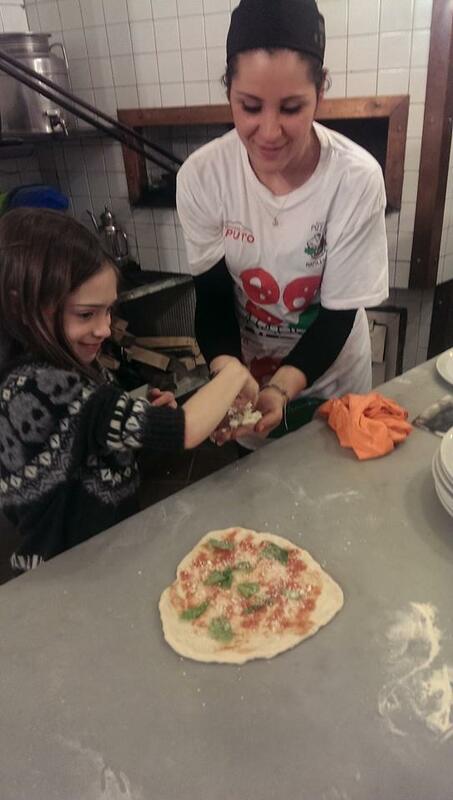 They, and many of the people we met in Napoli, treated us with great generosity. I’ve always defended Parisians against the common canard that they’re rude. Paris is just a big city, I try to point out, and living there is a hassle, people can feel hurried and harassed. The Parisians are no ruder than people in New York or London, where I have seen some pretty astonishing acts of incivility. I do stand by this argument, but I would amend my argument to point out that the people in some big cities, like three-million-strong Napoli, can be exceptionally kind. As a Parisian couple we met in Napoli pointed out, the city’s people are mieux chalereux que les parisiens (which I interpreted as “warmer” than the Parisians, but according to Google Translate means “more horny.” Francophones, please feel free to comment below). Twain comments with some horror on how the streets of Naples “swarm with people.” As Twain puts it, the city “is worse than Broadway repeated in every street, in every court, in every alley! Such masses, such throngs, such multitudes of hurrying, bustling, struggling humanity! We never saw the like of it, hardly even in New York, I think.” But that’s what we liked so much about the city. It felt so alive, nothing like the disneyfied tourist towns of northern Italy (Venice, I’m talking about you). Ramshackle building, streets full of people, everyone everywhere speaking Italian, a party every night outside our hotel (but windows thick enough to keep the noise down), Naples was hot. And if all that warmth gets to you, rest easy: Naples also has gelato. The kids’ liked Gay-Odin the best for its whipped cream topping, we like it best for its name. loved this. I’ve always wanted to go to Naples and now I want to go even more. Barring that, I cannot wait for Tim & Maya to make me some pizza.